Corporate monopoly is the enemy of creativity and variety. The biggest news in entertainment this week was the talks between Disney and Fox to sell most of 21st Century Fox to The Walt Disney Company. Whether the talks are still going on behind closed doors or not presents a fascinating topic to discuss! This deal, which would be the biggest film/media deal ever, has far reaching effects upon the industry. Some may even argue that it has danger written all over it. If there wasn’t already a rigid oligopoly amongst the studio/distribution companies, there will be if this goes through. Should this go through without the government swooping in to save the day with monopoly claims in the vein of the historic Paramount Decision, the lion’s share of the cinematic marketplace would be controlled by Disney, TimeWarner (Warner Bros.), and Comcast (Universal), with Sony (Columbia) and Viacom (Paramount) bringing up the rear. Five. That’s right. Five companies would essentially determine the future of the industry, and control the majority of the motion pictures released in theaters and the content on cable television (and the streaming services that access it). It’s a mirror image of the 1940s. Instead of The Big Five and The Little Three, we have The BIG Three and the Little Two. From the big screen to the small screen, you will notice the effects in the programs you watch. When one company controls the majority of any marketplace, it usually spells disaster for the consumer; furthermore, it means that there will be a primary gatekeeper in future artists getting his or her work out there. Not to mention that the programming on FX and other Fox (non-broadcast) subsidiaries could begin to gradually feel and look more like ABC programming. Could this put shows like The Simpsons and Family Guy on an endangered species list of sorts? Not right now. The deal, in off-and-on talks, would sell off 21st Century Fox (movie studios) and not Fox or Fox Sports (an acquisition of that sort would not be permitted because it WOULD be illegal). So, even if this buyout were to happen, The Walt Disney Company would still continue to be the brunt of many jokes on The Simpsons and Family Guy. A buyout could mean, however, that program options will seem less varied and just more of the same ABC-schlock that already pervades the bandwidth. The two companies that have the most TV programming are Fox and Disney, with Sony (CBS), Viacom (non-broadcast Nickelodeon), Comcast (NBC), and TimeWarner (CW) trailing in original programming. That being said, TimeWarner has done very well with The CW, and I hope it continues to churn out programs such as Vampire Diaries, Supernatural, Riverdale, etc. Beyond the negative impacts on content, which, in all honestly, can be quite subjective in nature, are there legal or ethical implications here? Is there perhaps a past precedent that could be used in the courts to stop such a buyout (or sellout rather–Fox)? Let’s look at the most famous suit brought against the major motion picture studios: The Paramount Decision [(U.S. V. PARAMOUNT PICTURES, INC., 334 U.S. 131 (1948)]. Prior to the Paramount Decision, the motion picture industry was controlled by a few companies that were heavily vertically integrated. The Studio owned the facilities, production companies, staff (under long-term contracts), the films themselves, distribution channels, and the movie theaters. When the studios were growing so large that they began infringing upon the free marketplace, the US Government forced the (then) eight major/minor studio players to end the practice of block booking (meaning, films would now be sold on an individual basis), divest themselves of their respective theatre chains (sell them off), and modify the practice of long-term employee contracts (though, this would continue until the 1960s). This marked the beginning of the end of the Studio System, AKA Hollywood’s decentralization. There are many similarities between the situation in the late 1940s and today. In fact, it’s a little worse today because the industry is mostly controlled by five (instead of eight) companies, and these companies have heavy investments in streaming and television programming. The problem with the current state of capitalism in the Unites States isn’t worries of monopolies but oligopolies (monopolistic practices between a few firms that essentially control a market). Certainly the state of the film industry already lends itself to an oligopoly because of the few companies; but the buyout of 21st Century Fox by The Disney Company would greatly increase this issue of a blatant oligopoly. If a monopolist (in many other industries) did what Disney is doing, neither the public nor the government would stand for it; but because it’s Disney, and because it’s the film industry, most of the general public is unaware of the negative consequences of such a buyout. 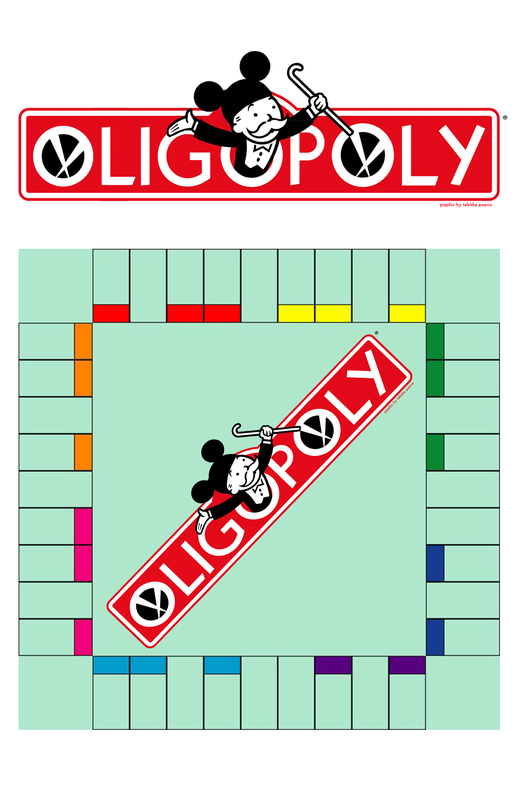 Technically speaking, oligopolies are not illegal nor is monopolistic competition; however, this can be a slippery slope towards stifling creativity or making is increasingly difficult to break into any given industry as a newly emerging competitor. Incidentally, monopolistic competition causes the variety or level of differentiation of similar products (i.e. moves and TV shows) to become less heterogeneous and nearly come across as homogenous. For many, it will feel like there are only two primary companies controlling the majority of programming on TV and a few companies controlling a large portion of the movies that get released in movie theaters. When a strong oligopoly exists within a specialized industry (for our purposes, media & entertainment), one of the side effects is a concept known as parallel exclusion. This concept can be described as the collective efforts of the few industry leaders who essentially act as the main gatekeepers to prevent or make it difficult for would-be newcomers to enter the arena. Parallel exclusion is nothing new, and has been in the news as recently as the last 2-3 decades within the airline and credit card industries. Throughout the eighties and nineties, Visa and MasterCard essentially blacklisted any bank that set out to do business with AmEx. Thankfully, the U.S. Justice Department stepped in when the manner in which the exclusionary rules were written crossed legal, fair trade boundaries. There were similar issues within the airline industry as well. When a few companies control the content or services in the marketplace, antitrust issues are raised. Although we are not facing a technical monopoly with the possible acquisition of Fox by Disney, we are looking at an abuse of power that leads to anticompetitive conduct. If nothing else, the consumer should be worried about having fewer options for programming. Not that the number of programs or movies will shrink, but there will be little difference between what is released under the Disney banner and the Fox name (if it’s still even called that). In a deal like this, it’s the consumer who gets the short end of the stick. The consumer would be wise not to give Disney a pass just because there are a small group of big film studios instead of just one. While Marvel fans may be excited that the X-Men can join the MCU (Marvel Cinematic Universe), there is the possibility of a lack of competition between brands thus mitigating innovation and ingenuity. Competition is the mother of innovation just as necessity is the mother of invention. Because the Walt Disney Company is primarily focussed on producing the biggest movies possible (after all, they made five of the 10 most successful films last year), the mid-budget dramas and comedies that used to thrive in Hollywood–you know, the ones that cause you to cry and laugh–would dwindle in number–there would be little room for them to make their respective ways into theaters in a predominantly Disney controlled industry. What we are essentially talking about here is a corporate cinematic monolith, the likes of which, has never been seen before.